FILE - A still image taken from a video shot on Oct. 1, 2017, shows protesters waving Ambazonian flags in front of road block in the English-speaking city of Bamenda, Cameroon. Tensions continue to climb in the Anglophone regions of Cameroon as separatist groups demand the release of their leader and 46 other prisoners extradited last month from Nigeria. The government has sought to reassure the population. A woman and her husband cry at the Bamenda regional hospital mortuary in northwestern Cameroon. The woman has just discovered the lifeless bodies of her younger brother and three others. She said they were arrested last Wednesday and accused of killing two gendarmes. She refused to grant an interview, but workers of the hospital told VOA the bodies were brought there by unidentified men. The so-called Anglophone crisis began in Cameroon over a year ago, sparking bouts of deadly unrest and more recently, clashes between alleged separatist militants and security forces. 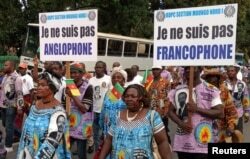 The Anglophone community in Cameroon is protesting political and economic discrimination in the majority French-speaking country. Joseph Banadzem, lawmaker from the northwest region, said the military is responding by violently cracking down on the population. FILE - Demonstrators carry banners as they take part in a march voicing their opposition to independence or more autonomy for the anglophone regions, in Douala, Cameroon, Oct. 1, 2017. "The army who are supposed to maintain law and order, to protect property, to protect lives, [they] go on the rampage in villages, burning houses, burning food stuff, people’s stores and so. All ransacked. It is unbelievable. It is inacceptable. It is inhuman," he said. Colonel Didier Badjeck is a spokesperson for Cameroon's military. He said the military is committed to preserving Cameroon’s territorial integrity. He said the armed separatists are using mercenaries and carrying out abuses on the population, whom he said will very soon understand that they have to trust only the country’s military. Violence has escalated since January when Nigeria detained and then extradited separatist leader Ayuk Tabe Julius and the 46 other alleged separatists to Cameroon. The separatist groups are demanding their leaders be released. At least four schools have been burned as of last Friday and at least 12 people have been killed, according to local media, which report unconfirmed casualties among both armed separatists and soldiers. Many businesses remain closed in the two English-speaking regions amid fears of more violence. The 47 detainees extradited from Nigeria have not been seen in public. International human rights groups warned against the extradition, saying the detainees could face torture or worse. Nigeria is now also facing criticism from the U.N refugee agency, which said that most of those handed over to Cameroon had applied for asylum in Nigeria and their "forcible return" violated Nigeria’s international obligations. On Friday, Cameroon government spokesperson Issa Tchiroma issued a press release saying the detainees are safe and would be appearing in front of the law courts soon. He did not comment on the charges they would answer. An earlier version of this story erroneously reported that four dead bodies were brought to Mbingo Baptist Hospital. The name of the hospital has been corrected to Bamenda regional hospital. VOA regrets the error.